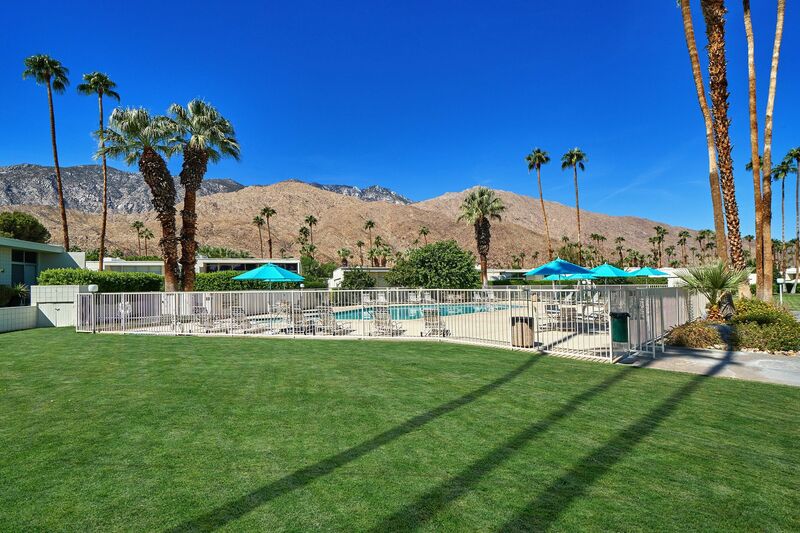 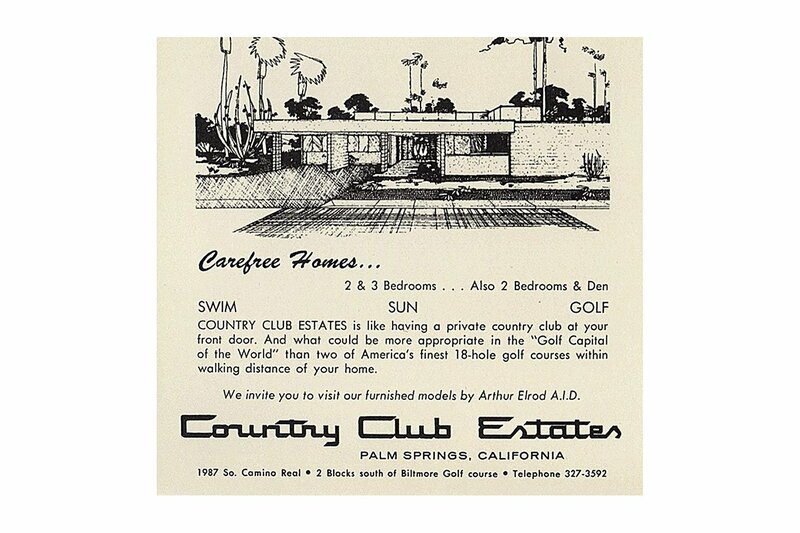 In ultra-exclusive South Palm Springs, lies the fabled community of “Country Club Estates”. 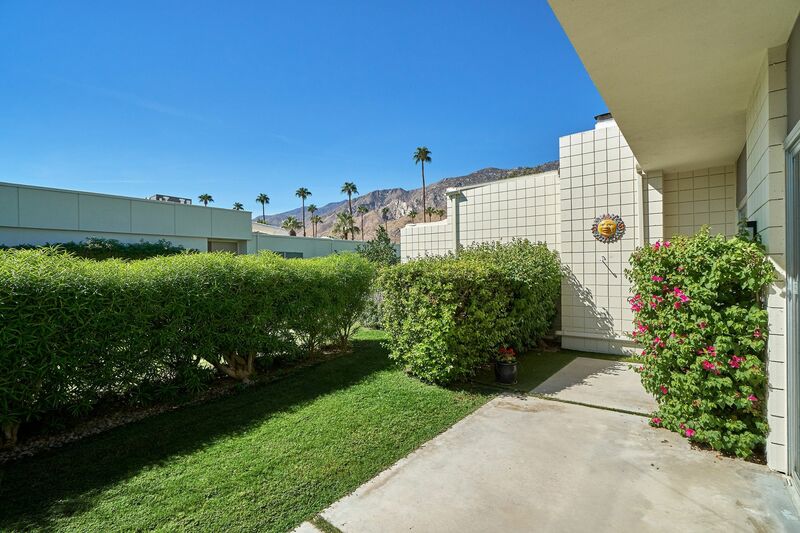 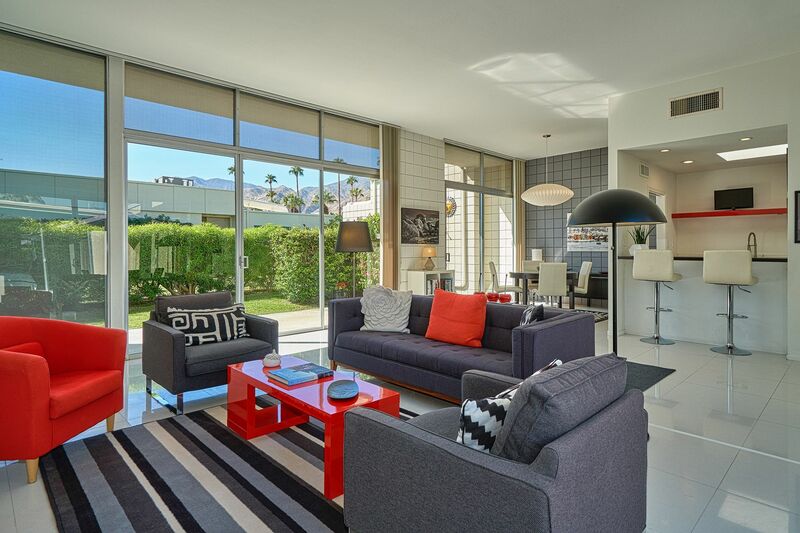 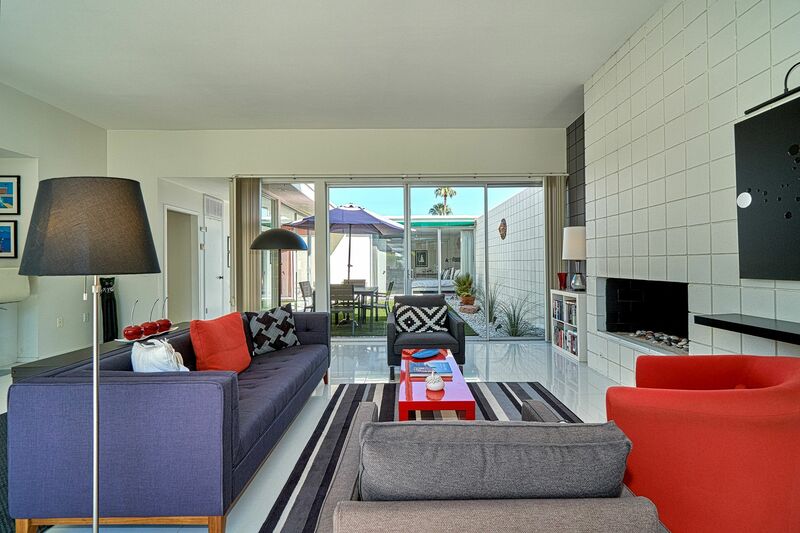 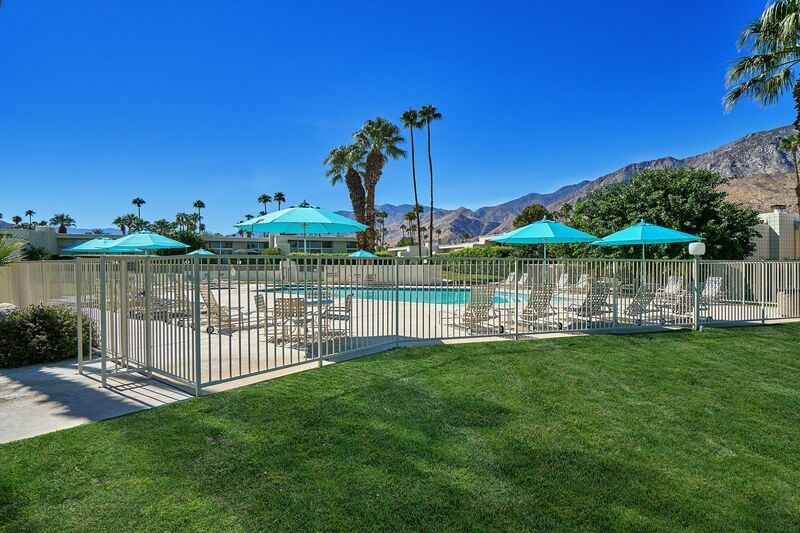 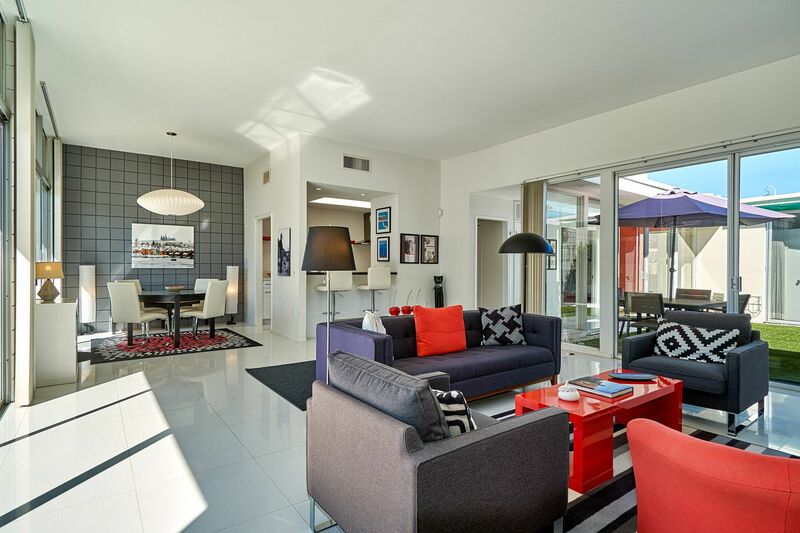 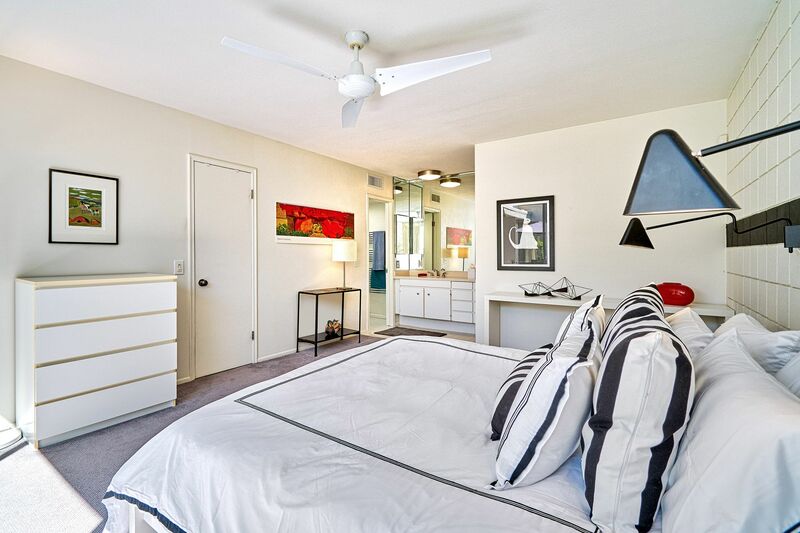 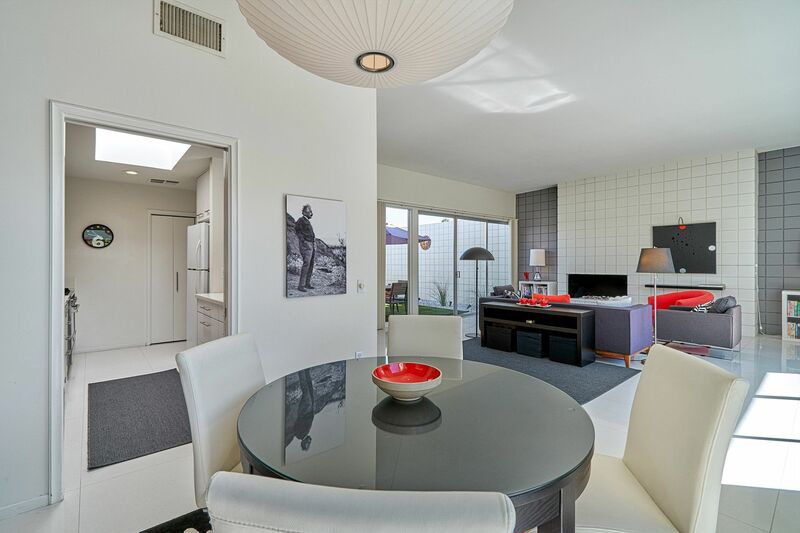 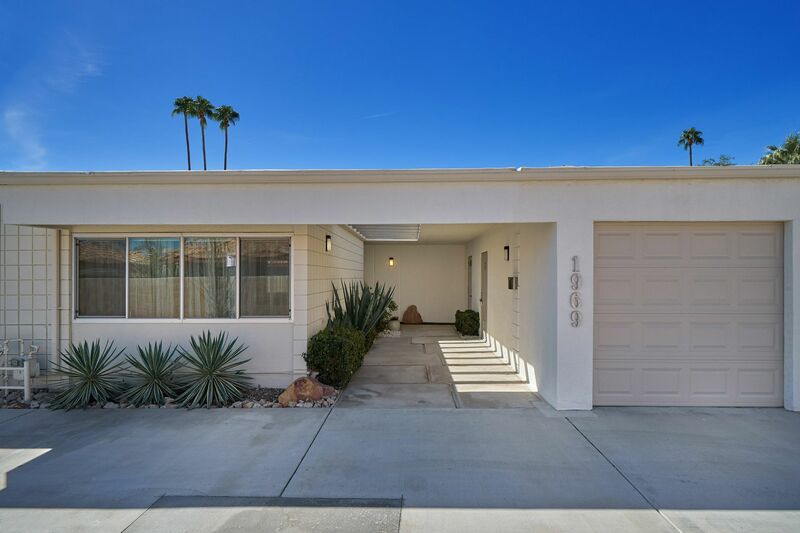 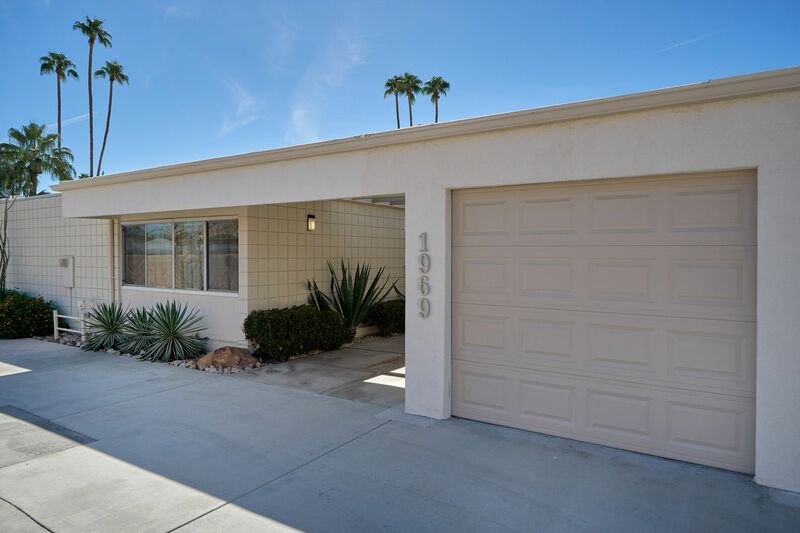 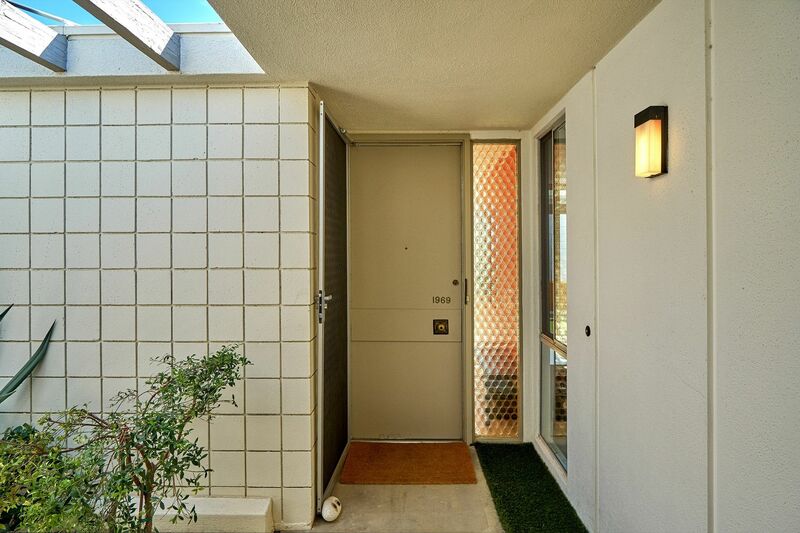 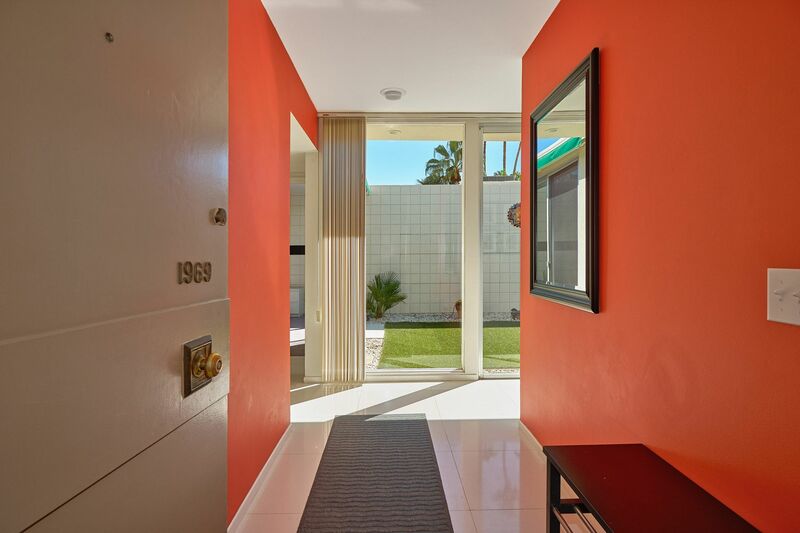 Designed by famed “Sunnylands” Architect - A. Quincy Jones in 1965, this 30-unit enclave will captivate you with iconic mid-century architecture and epic mountain views. 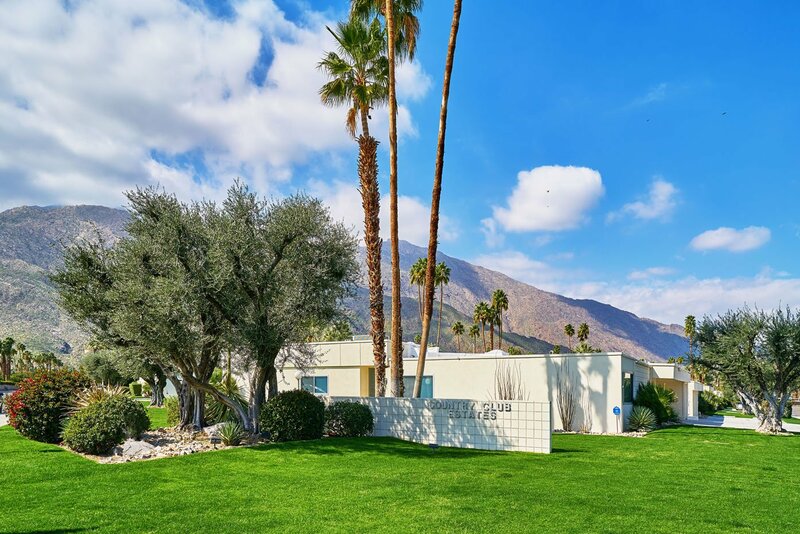 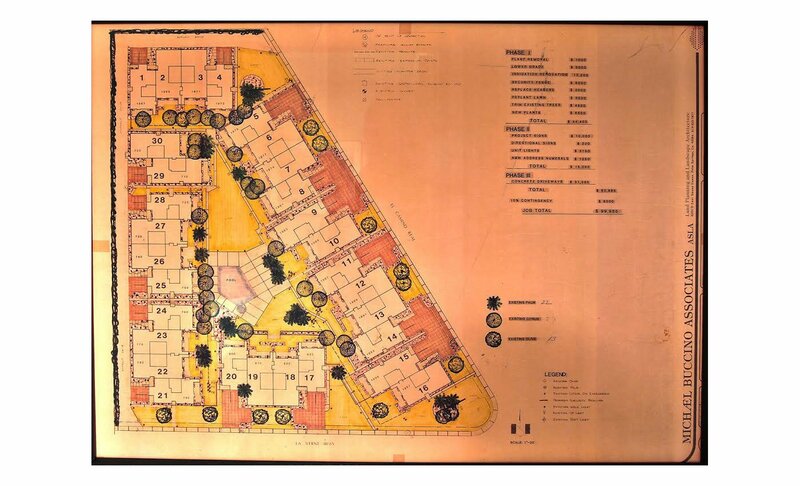 The modest exteriors outline a triangular structured community layout, with park-like walkways, lush grass and a center pool that is a sparkling mirage in the desert oasis. 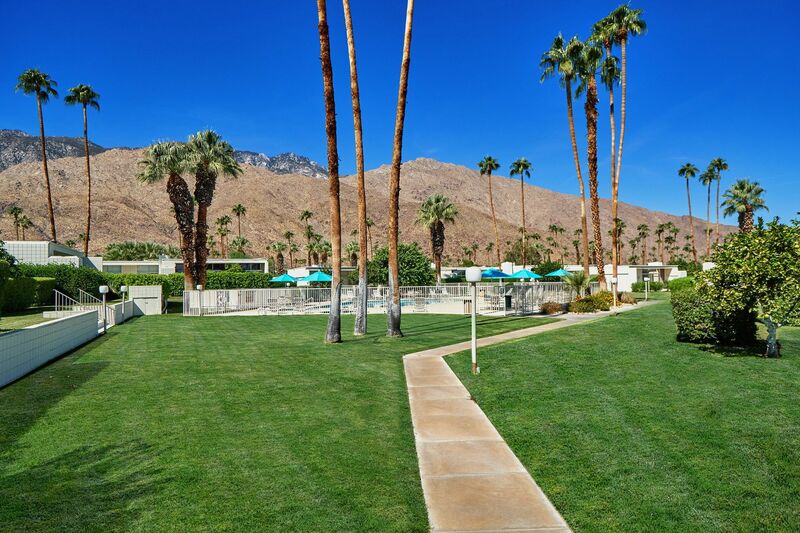 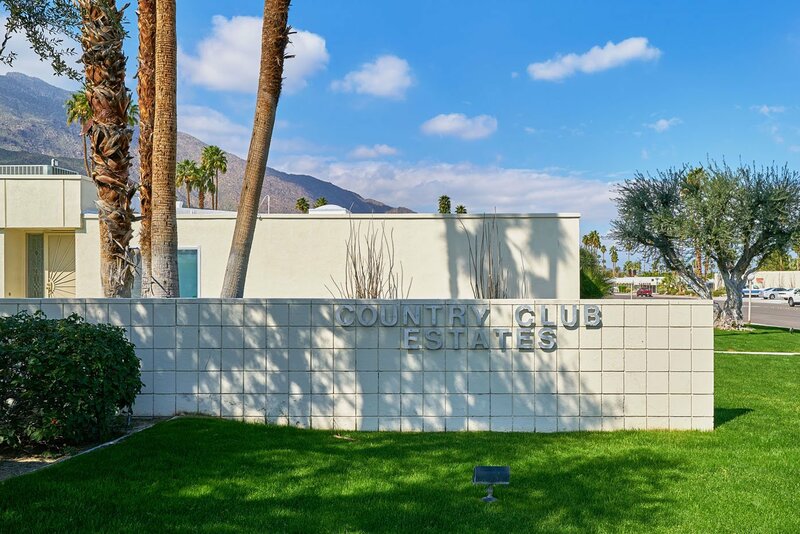 Country Club Estates was featured in "Modernism Week" 2017, and received visitors from around the globe. 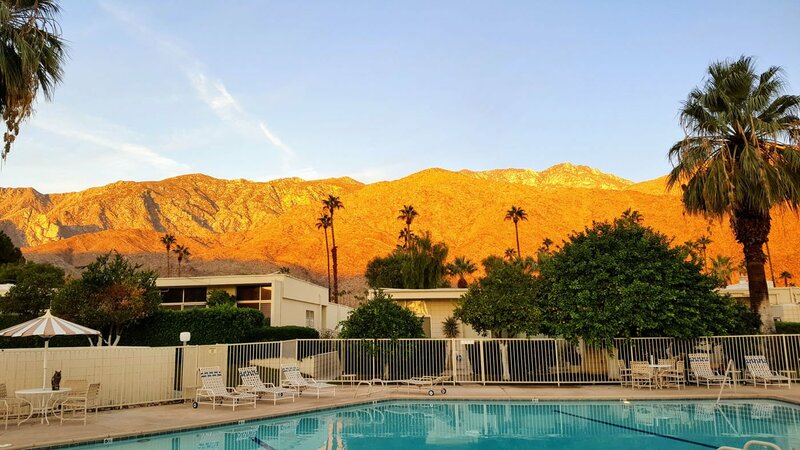 Many describing it as their favorite tour of the year. 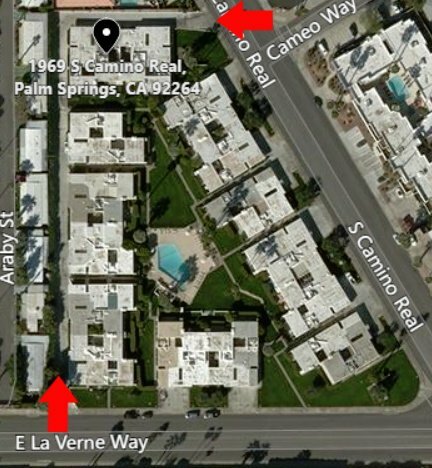 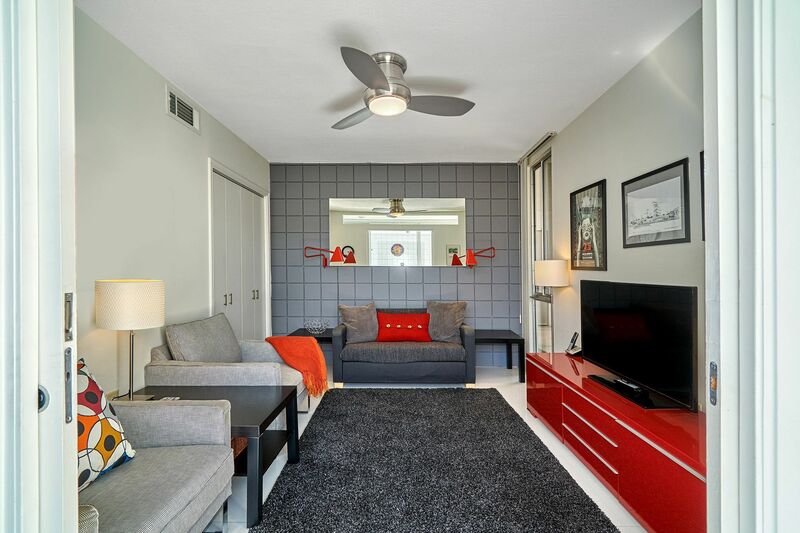 The unit at 1969 S. Camino Real, is perfectly situated off a private driveway and any main streets. 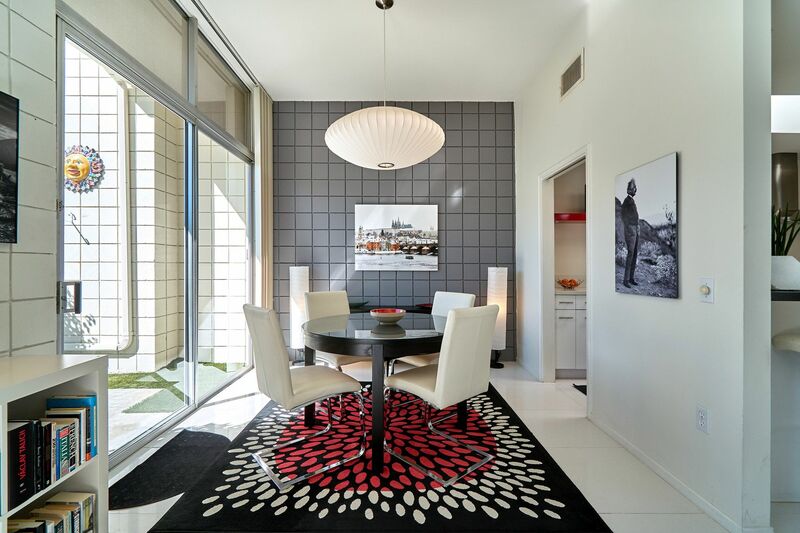 As you enter the unit, you are immediately drawn to a large center atrium that is the signature original design of the units. 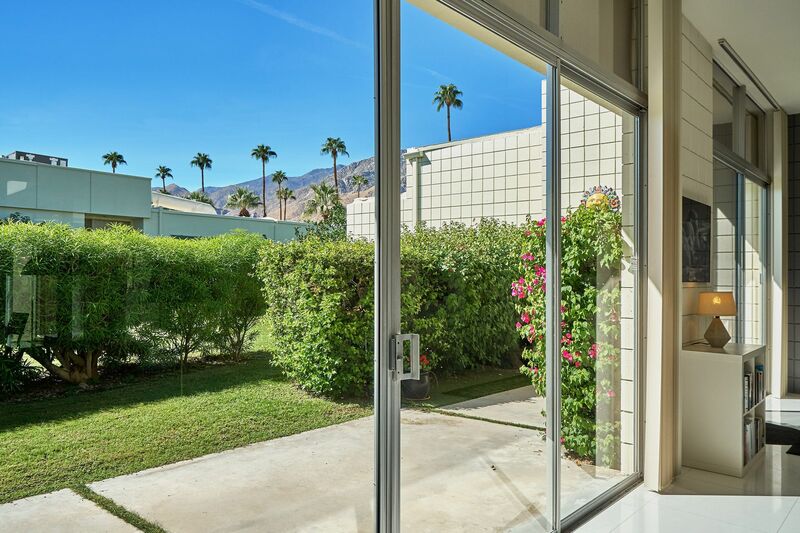 Flooding the space with light from all angles, the walls of glass bring the outdoors to the inside thus incorporating blue skies and towering palm trees into your daily routine. 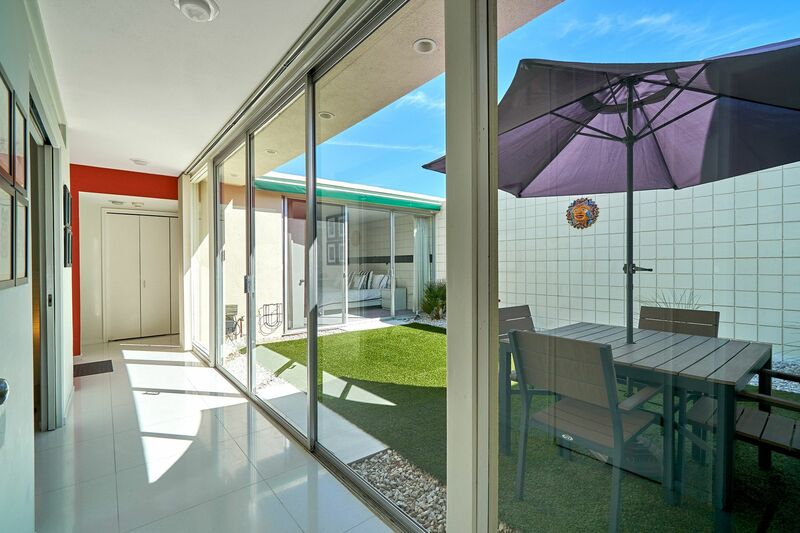 When shade is needed, an electric awning extends with the click of a button. 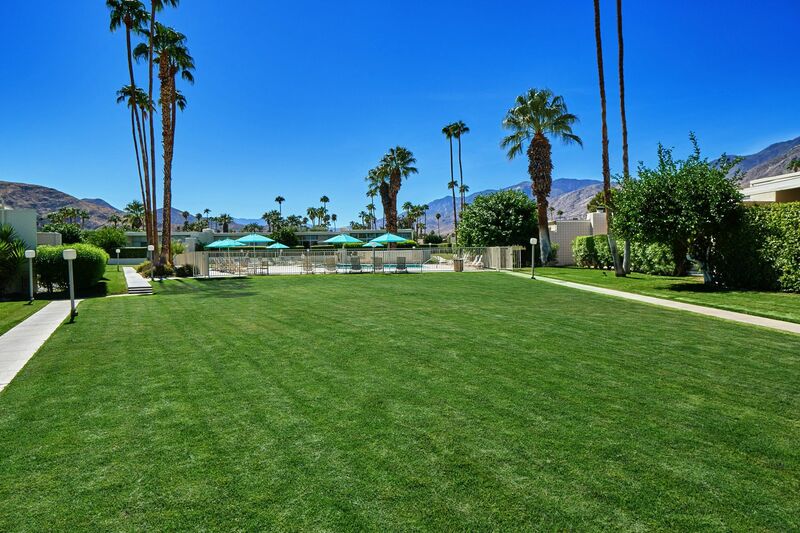 Low maintenance landscaping means less time worrying about your home, and more time relaxing. 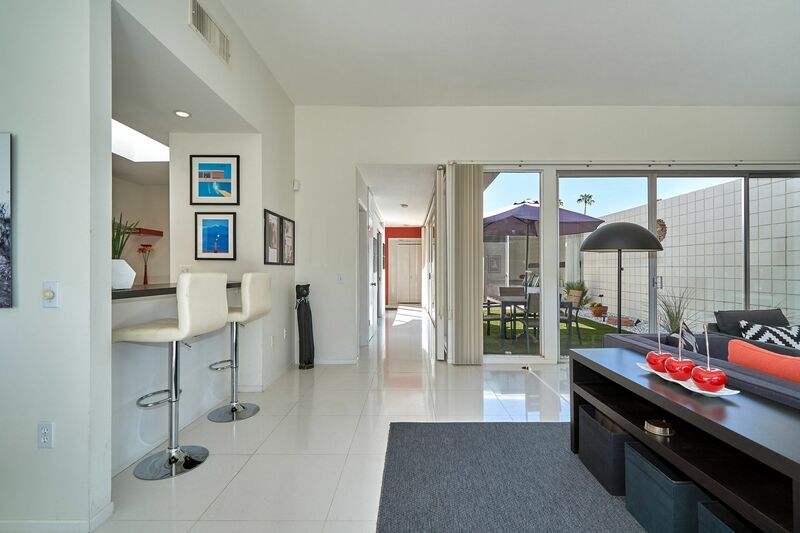 As you proceed to the living area, 10-foot ceilings open the space in dramatic fashion. 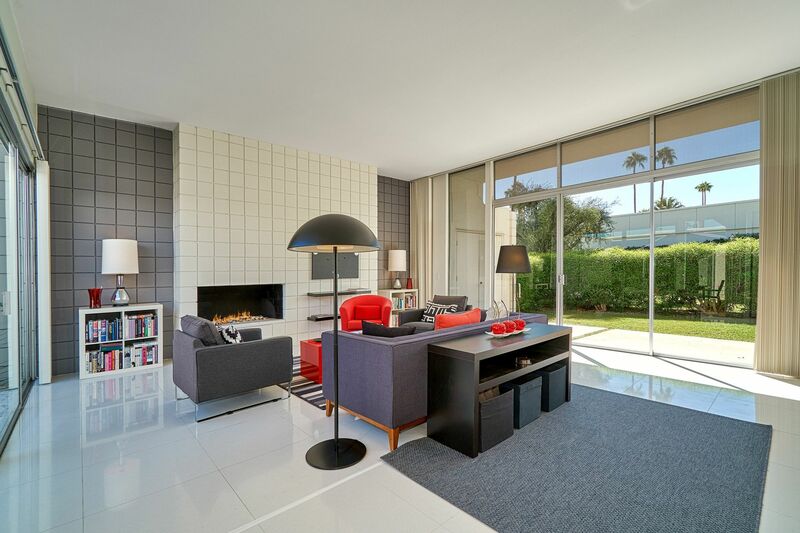 Stunning terrazzo tile floors add a retro accent to the 60’s architecture. 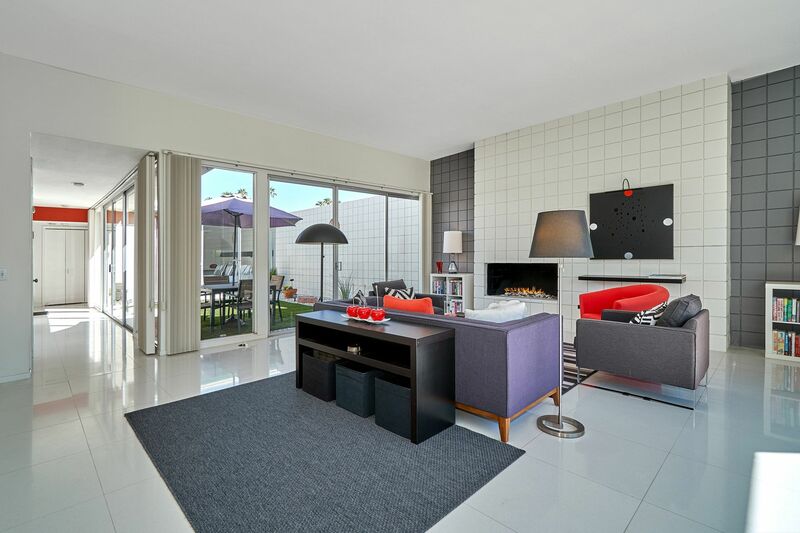 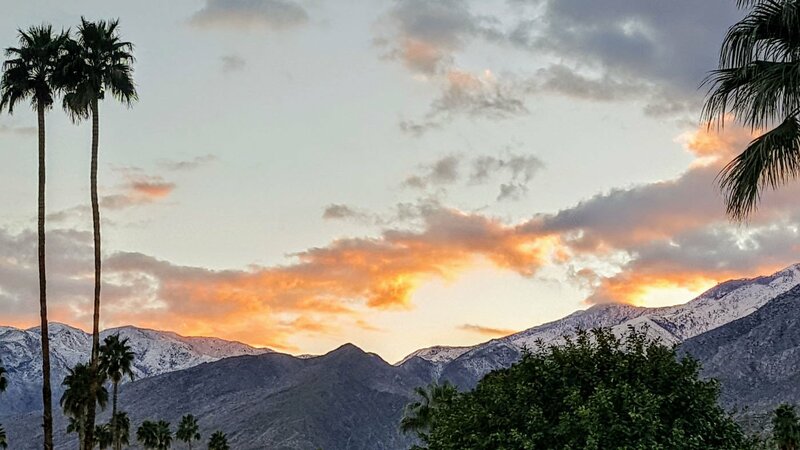 The chic off-center fireplace will emanate warmth on cool winter desert evenings, as you glance out and admire the snowcapped mountains. 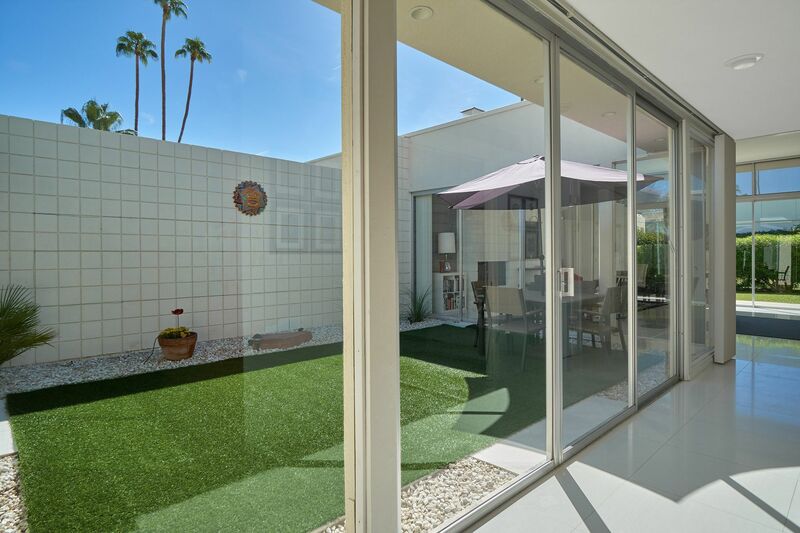 Vintage floor to ceiling windows and doors stream light and lead to a 2nd private patio with outdoor storage space. 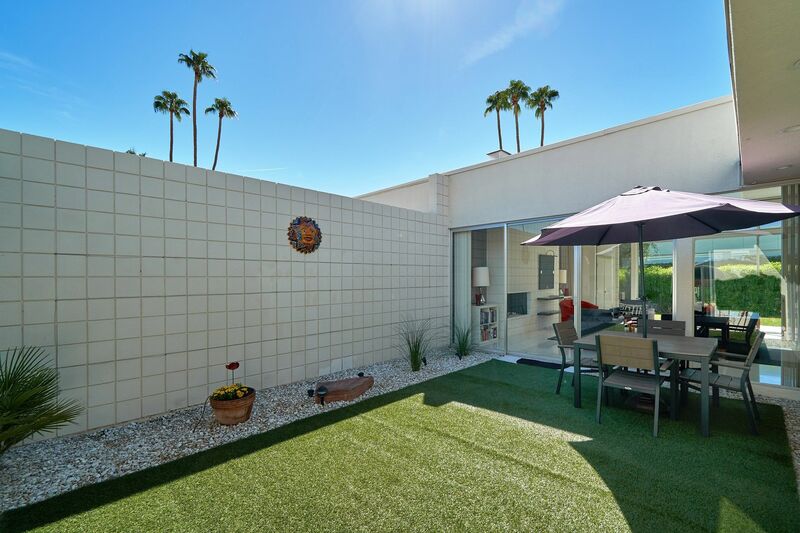 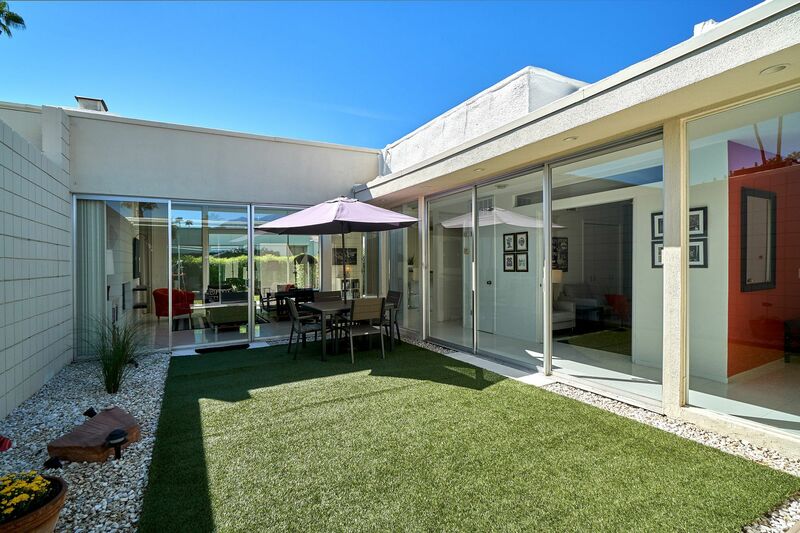 The patio has ample room for a dining table, lounge chairs, outdoor sofa or a BBQ. 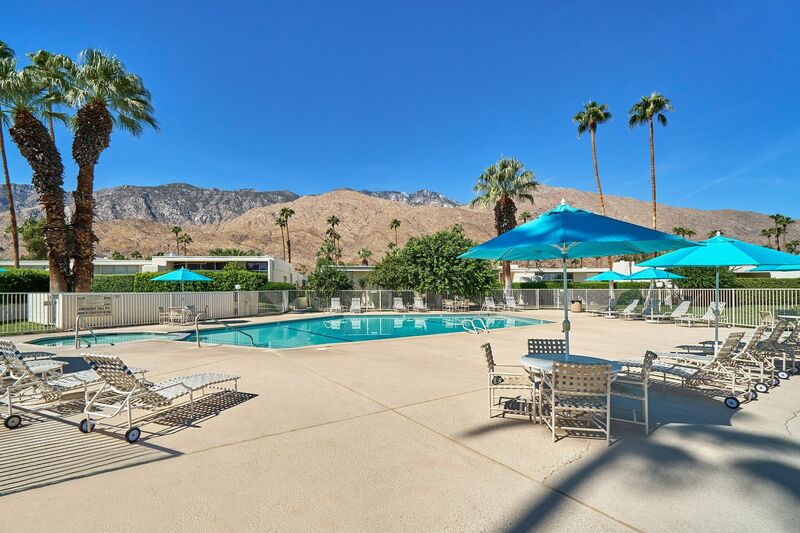 With mountain views, this will be another of your favorite areas to lounge and entertain. 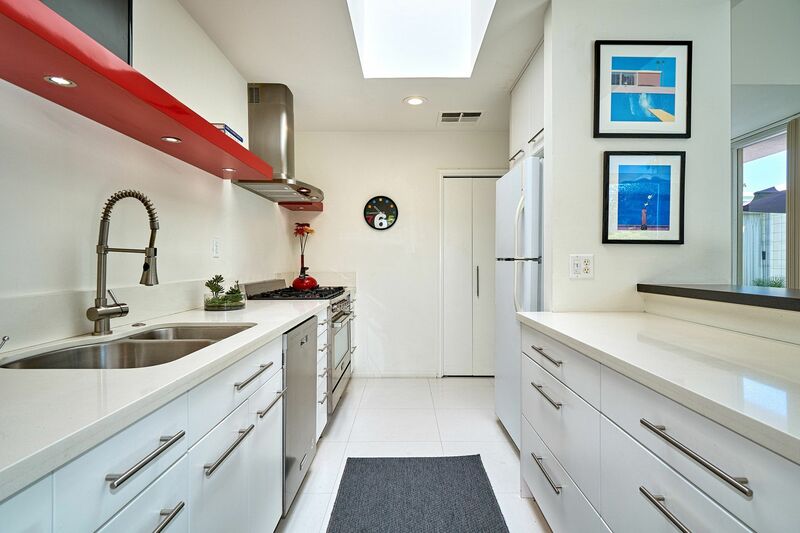 The updated kitchen features a five-burner professional Verona cooking range, quartz countertops, copious counter space, large pantry, and counter seating. 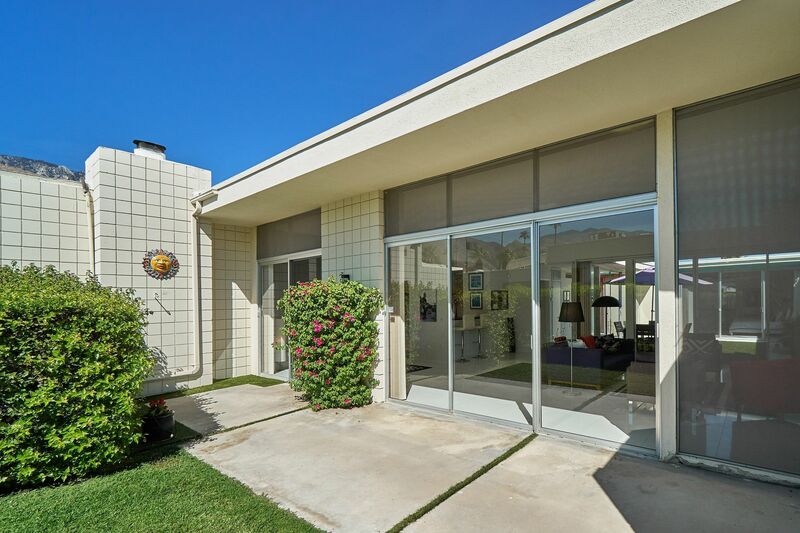 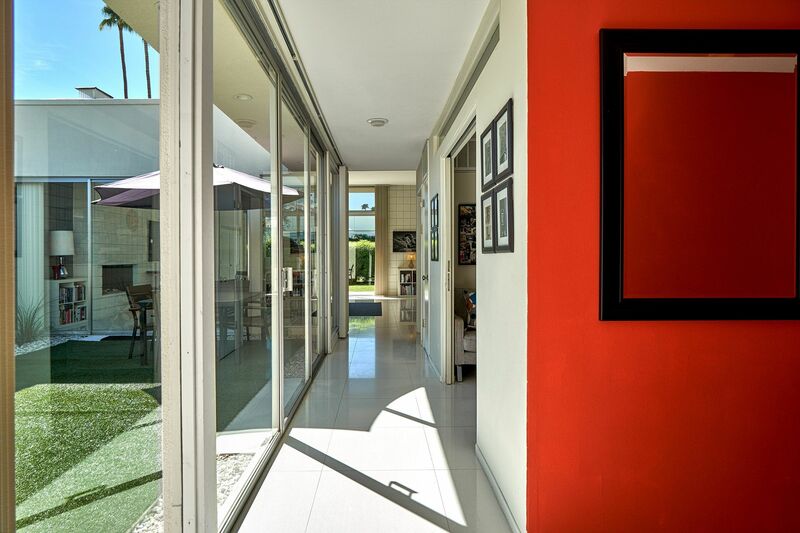 Staying true to A. Quincy Jones original design, the kitchen has separation from the living and dining rooms, with doors to separate the two while entertaining guests. 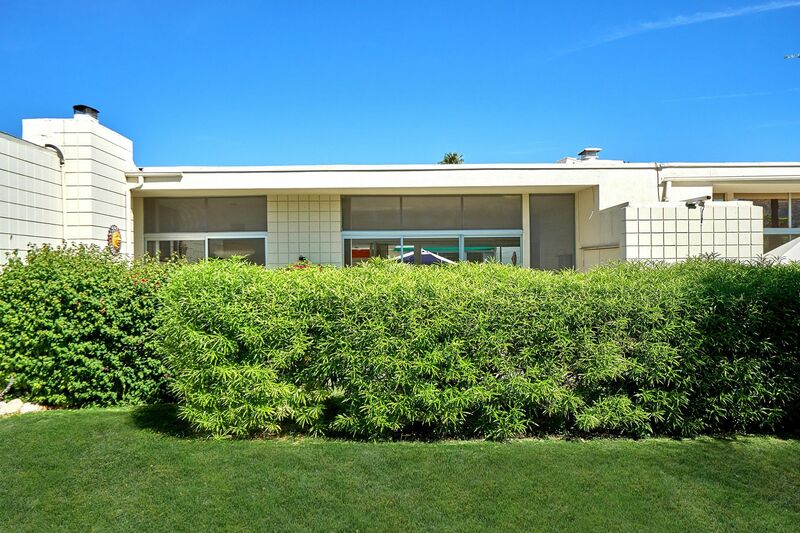 As you approach the north side of the residence, there is a den that can be used as a family room, office, or a 3rd bedroom. 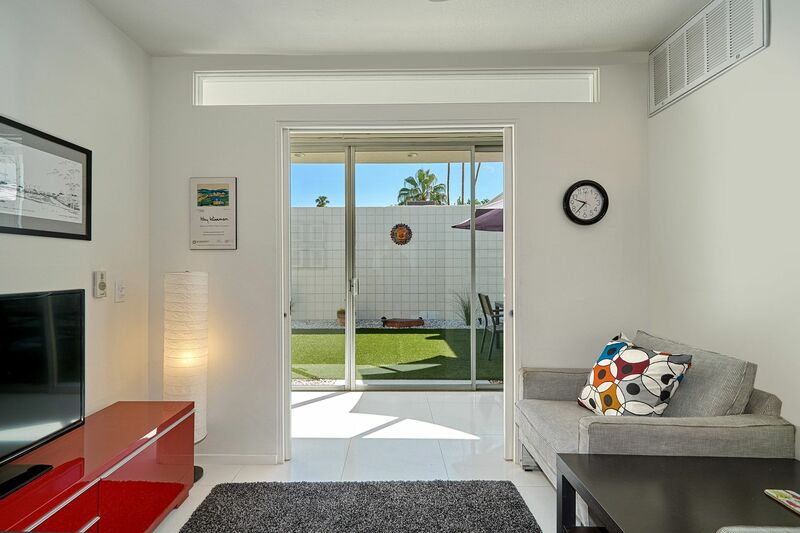 Complete with doors and a closet, this flexible space will come in handy for whatever your needs might be. 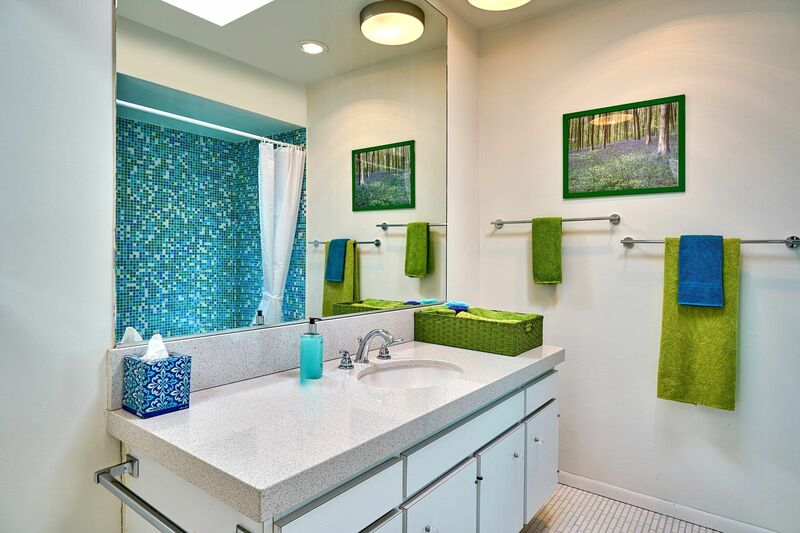 A beautiful guest bathroom with new tile-work, tub, clear skylight and quartz counters is sure to impress guests. 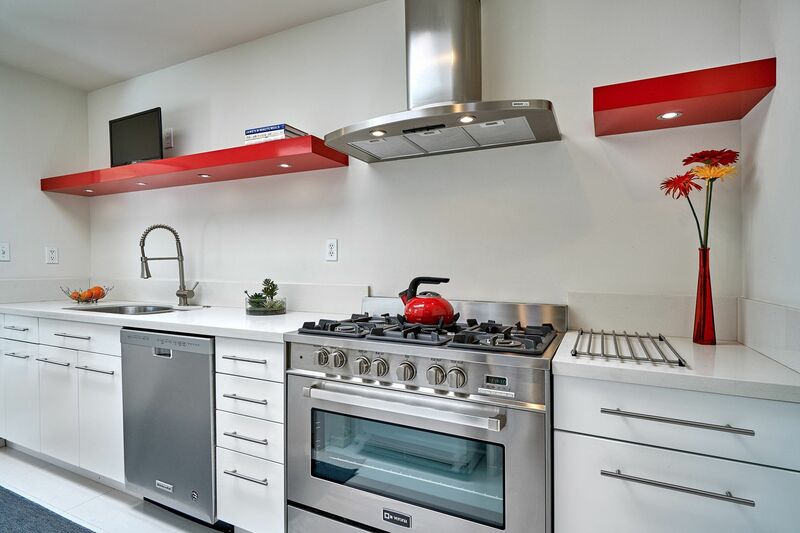 Take note the cabinetry is original and a seamless blend to the modern updates. 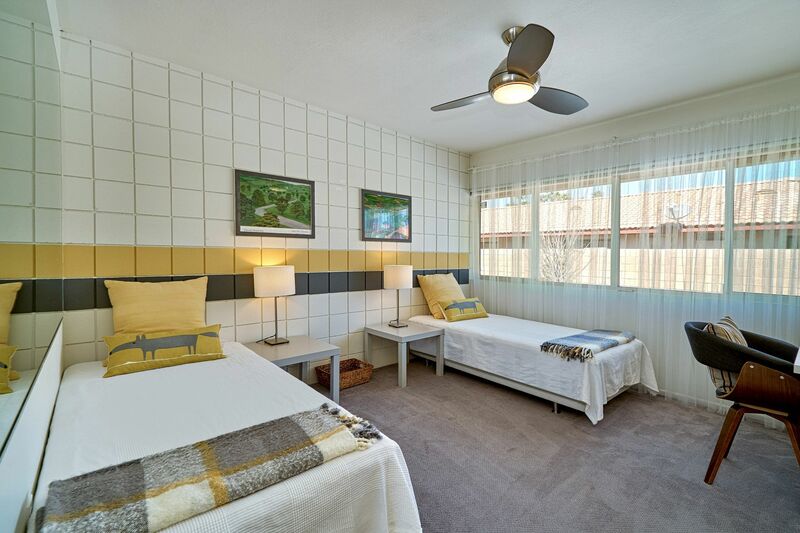 The guest-suite is appointed with original cinderblock walls, alongside a large walk-in closet. 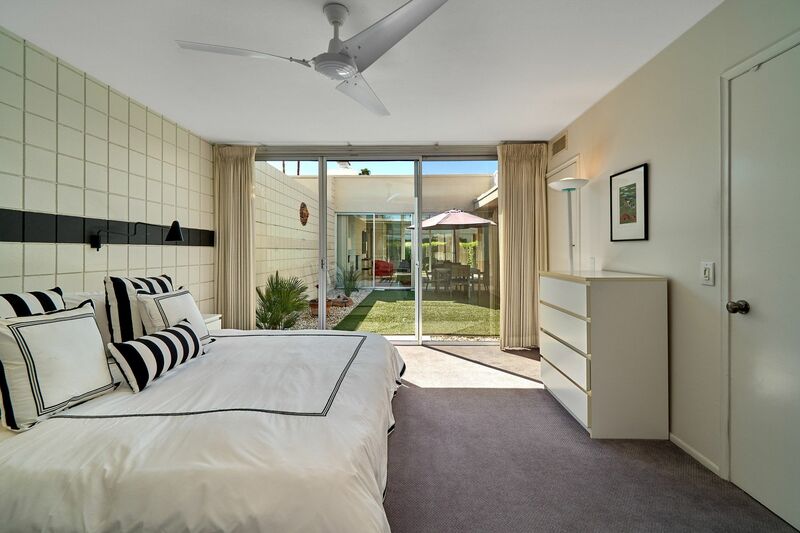 The master bedroom also has original cinderblock walls and is adjoined to the atrium allowing natural light to envelop the space. 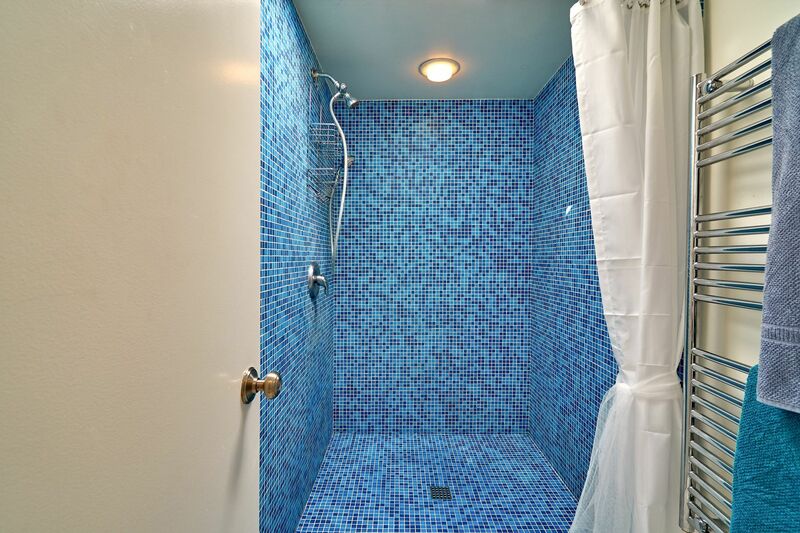 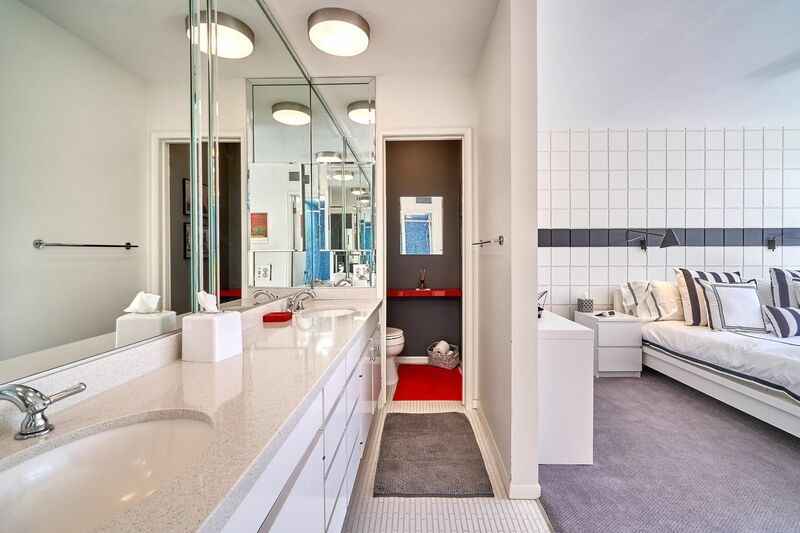 The partially opened master bathroom, another original feature, has dual sinks, quartz counters, original cabinetry, clear skylight, and a dramatically large shower. 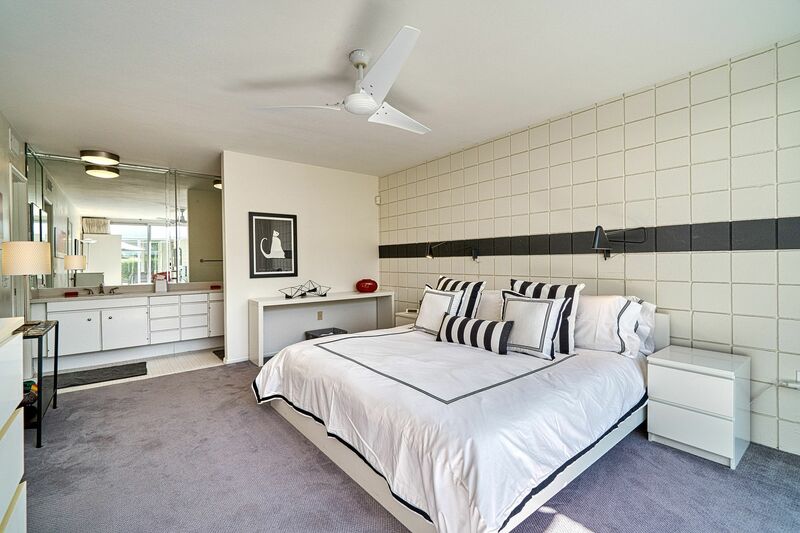 The huge walk-in closet allows for plenty of space for clothes, shoes and storage items.